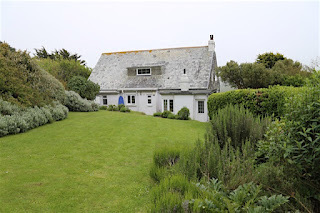 Overcliff is a spacious property set back from the road and only 100 yards from Porthcothan Bay. Padstow town is within easy reach. The house has great privacy and spectacular views of the valley. This is the ideal base for exploring beautiful Cornwall. This holiday home can accommodate 10 people in 5 bedrooms. These consist of 3 doubles and 2 twins. Some bedrooms are located downstairs.This spacious property includes a kitchen, dining room, drawing room, conservatory and utility room. Porthcothan Bay is a special place with a sandy beach full of character. It is ideal for surfing, coastal walks, sand castles, swimming and fishing. There are spectacular walks in either direction from the beach along the coastal path with the rock islands of Trescore lying a short way off the coast. The charming fishing port of Padstow is close by. It is a famous foodie destination surrounded by stunning sandy beaches.